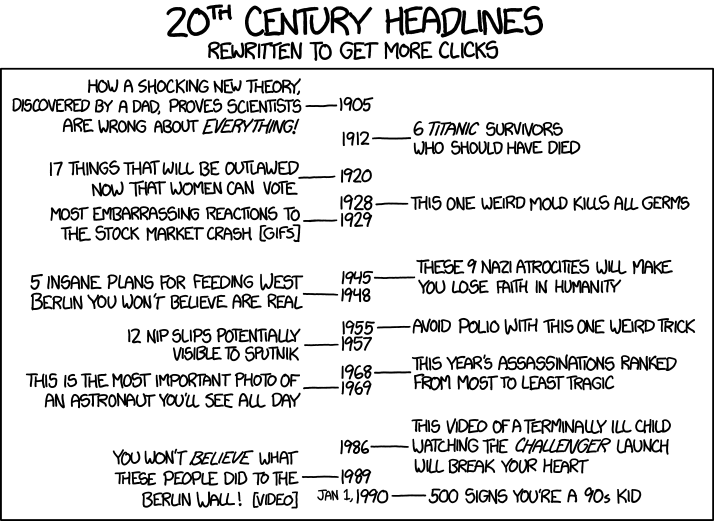 Headline writing has become an art-form all on its own (photo courtesy of XKCD.com). I want to focus on that nature of Buzzfeed and UpWorthy, and how exactly they’ve come to be so popular. Love it or hate it, we can’t ignore those kinds of affects that these sites have had on the news industry even in the past year or so. You regularly see major news outlets adopting listicles and reshaping traditional headlines into more colorful teasers. (Even I’ve tried to do the same thing on my blog.) And there’s good reason why news outlets are adopting these practices. Buzzfeed had a record high traffic rate last year with 130 million visitors in November. But what is it about fluffy lists and gripping headlines that make these outlets so popular? Somehow, Buzzfeed has been able to not only grasp the attention of its readers, but keep them around for longer periods of time. Lists promise content that is finite. You know beforehand how far you'll have to travel down the rabbit hole. 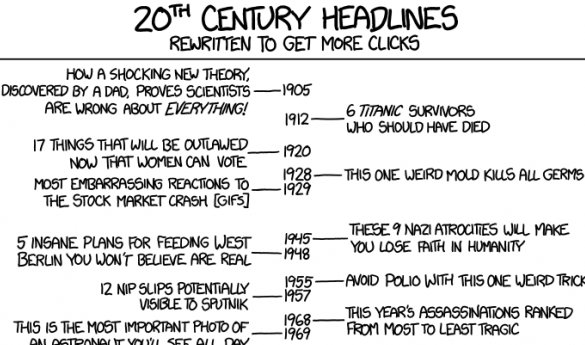 There’s actually some interesting psychology studies that look at how people consume news, and lists have repeatedly come up as the winner among a choice of more traditional headlines. As Jack Shepherd, editorial director at Buzzfeed, recently said at a conference, “The Internet is chaotic and frightening and it is nice to have it organized for you.” I’d say our numbers certainly support that hypothesis. But you may also be wondering – why should we care that Buzzfeed gets record numbers of hits? We’re trying to be a serious news organization that is actively committed to informing the public. In fact, despite the fact that Buzzfeed has been investing heavily in its more serious news stories – they’ve been able to get people to read them. The average time spent on a 6,000 word story for mobile users was 25 minutes! How are we supposed to achieve this by publishing content more like “6 Albus Dumbledore quotes to motivate you during finals week”? "Expected funding for Robinson demolition, renovation not included in state budget." "Mason plans to boost research credentials through investment, undergrad involvement." "Adjunct faculty pay, benefits not on par with comparable universities." All of these stories are really quite illuminating to the deep challenges that we face as a university and the direction that we're going – but they received substantially lower views than some of our other, less serious discussions. Here’s my problem with that approach. Those kinds of headlines create a certain amount of bias for the readers before they even read the content. Because the fact of the matter is, how we pay adjunct professors is actually an incredibly nuanced process. How would I be able to explain the relationship state-university finances, enrollment trends, and research funding all in a nice clean list? That's what I think lists are less capable of accomplishing: explaining relationships. Lists dissect topics that in reality are all mixed together into one confusing mass that we call higher education. So while lists and catchy headlines might help us reach more students, do we have to sacrifice the realistic complexity of our topics? I’m just not sure how we reconcile those two ideas.